Cheong Soo Pieng has been lauded as one of Southeast Asia’s most important artists emerging from the post-war Chinese diaspora. A pioneer of East-West modernism since the 1950s, he created a new visual language for artists in Asia, rising above the catastrophes of war and the schisms of nationalism. His emigration to Singapore in 1946 was followed by 40 years of constant experimentation with artistic composition and materials, placing him in an unequalled position among his peers and followers. 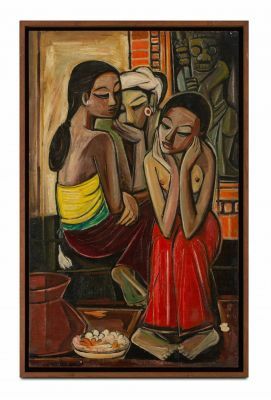 Soo Pieng was an artist who persistently experimented with a wide range of media and expressions, producing a large and diverse body of consistently excellent artworks. This exhibition focuses on how he inventively composed using Chinese ink, oil, metal and other materials. As the artworks were dispersed by the volume of exhibitions over time and continent, it has taken years to amass pieces that both fulfil the narrative about Soo Pieng’s achievements, as well as show off some of his finest compositions. With attention to the artist’s innovative composing processes, this exhibition gleans from important private collections to provide a definitive selection of some of his most seminal creations. In review are both popular favourites and newly-revealed masterpieces that allow fresh considerations of some of the artist’s most important achievements – the subject of the personality of the people of Southeast Asia, the re-creation of the Chinese-styled landscape, and Soo Pieng’s development of modern abstraction.